"No, We Have No Illusions That It Will Be Easy"
14ymedio, Yoani Sanchez, Havana 20 December 2014 -- Since December 17, Cuba has not been the same. Discussions, questions and expectations have multiplied among us since the announcement from Barack Obama and Raul Castro about the reestablishment of relations between the United States and Cuba. We citizens have a lot of questions about the process and its influence on the future of our country. 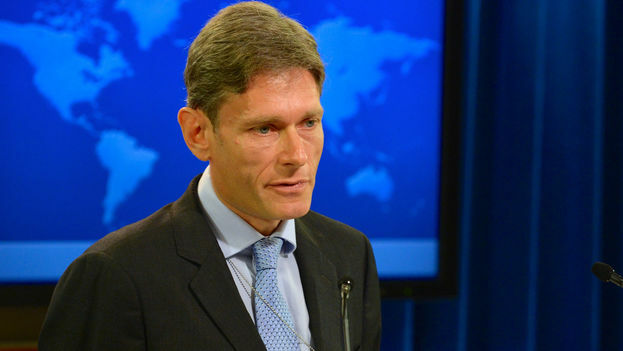 Tom Malinowski, United States Assistant Secretary of State for Democracy, Human Rights and Labor has responded to some of these questions for 14ymedio. Today we present his answers to our readers. Sanchez: The US has announced several measures to ease its policy towards Cuba. During the negotiations has the Cuban government shown a list of measures it is willing to implement? Malinowski: It is important to note that the measures announced by President Obama were not things he has asked of Cuban government. They have been steps we would like to take to empower the Cuban people. The objective is to strengthen the possibility that the people themselves can change the public policies of the Cuban government through greater access to resources and information, as well as to improve the quality of life for Cuban citizens who have lived with unnecessary social, economic and political restrictions imposed by the government. The Cuban government has indicated that it will release 53 political prisoners, an important first step for us, and it will also allow its people greater access to the internet. We have no illusions that it will be easy, but we feel that now we have an opportunity and we will be pushing hard. Q: Do you think President Obama or Secretary of State John Kerry will visit Cuba in the coming months? Would it not be against the embargo? R: President Obama has said that from now on senior US government officials will visit Cuba. Roberta Jacobson, Assistant Secretary of State for the Americas, will be responsible for the delegation that will travel to Havana in January 2015 for the round of negotiations about migration between the United States and Cuba. Secretary of State John Kerry has also said that he hopes to be the first Secretary of State in 60 years to visit Cuba. With regards to the embargo, US law prohibits certain transactions with agencies of the Cuban government. President Obama announced several modifications to the rules to facilitate the flow of resources and information to the Cuban people. In any case, visits of high officials will be part of the new diplomatic relationship between our countries. Q: Has legalization and an opening for a free and independent press in Cuba been among the topics discussed by the two governments? A: Yes. A key focus of our policy will be to support civil society so that every Cuban can have the right to freedom of expression, association, assembly and the press. We will insist on these reforms in our meetings with the Cuban government working together with other countries in Latin American and Europe. We will continue to implement programs financed by the United States Congress to support fundamental freedoms, including freedom of the press and the free flow of information. The changes announced by President Obama eliminate one of the pretexts used by the Cuban government to persecute citizens who work to guarantee that the people have more freedoms. Now the focus of attention will not be on US policy toward Cuba, but on the policies of the Cuban government itself. Q: Is there a schedule with already defined timelines to put into effect the measures announced on 17 December? And if so, when will it be made public? A: President Obama wants to streamline the process so that the vision he presented in his speech is implemented as soon as possible The Secretary of State and all the members of president's cabinet understand the urgency that exists to take advantage of the opportunities presented by the new measures. The changes in our regulations to increase travel and trade will happen very quickly; the normalization of relations will depend on the Cuban government and also that of the United States. This issue will be discussed by the Undersecretary of State Roberta Jacobson in January.